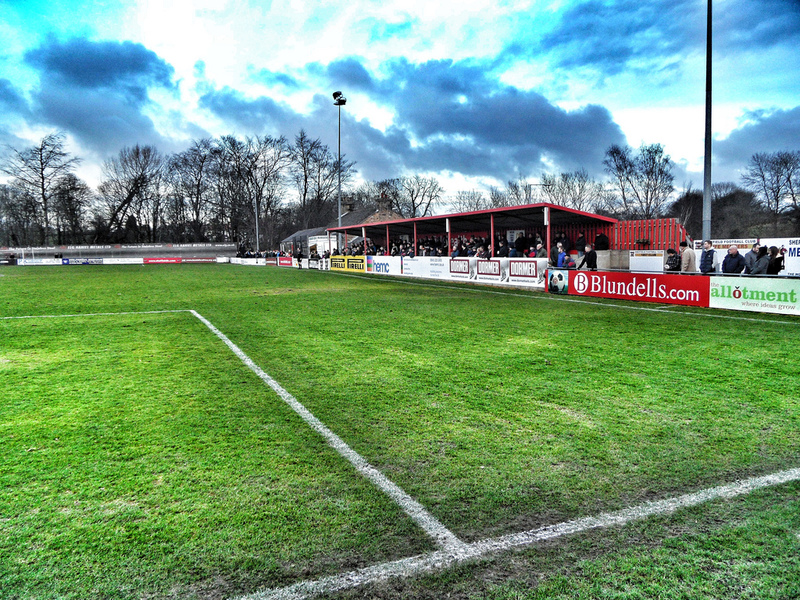 About the BT Local Business Stadium With a capacity of 2089, The BT Local Business Stadium is the first permanent home of Sheffield FC. The club proudly moved to the BT Local Business Stadium in 2001 and opened the ground with an exhibition match against Manchester United. The BT Local Business Stadium was previously known as the Coach and Horses Ground and is located on land to the rear of the Coach and Horses pub in the town of Dronfield just south of Sheffield. The ground had previously been the home of local football team Norton Woodseats. The stadium has seating for 250 and a terrace stand including disabled facilities and 2 refreshment outlets. A club shop is on site, stocking a full range of merchandise and of course, don’t forget the Coach and Horses pub, serving a range of locally brewed Thornbridge Ales, for a pre match meal and a pint. How to get to the BT Local Business Stadium The ground is located in the village of Dronfield, which isn’t actually in Yorkshire at all, but in Derbyshire. It is a good 20 minute drive down the A61 from Sheffield. Go straight on at the Norton roundabout then at the next one, after passing the Hilton on your left, take the second exit off the roundabout into the village of Dronfield. The ground is a few hundred yards down the hill on the right hand side. There is parking at the ground and in the pub car park. A train also runs from Sheffield to Dronfield every hour (at 5 past) and takes 10 minutes. From the station turn right and simply follow the road, although it is a fair hike. Admission to the BT Local Business Stadium A bargain £6 admission for adults this season, £3 concessions. Programmes at £2 for 48 pages are also great value for money. Our last visit – January 2013 Real Madrid and which other football club have been awarded the FIFA Order of Merit? The highest honour that could be bestowed by the Gods of Football. Barcelona? Manchester United? Carls Zeiss Jena? The great Ajax team from the 1970’s? Wrong on all counts. The honour, bestowed back in 2004, went to a club who play in the eighth step of English football, who see less than 250 people come through the turnstiles every two weeks. This is the ultimate football trivia question, unless of course you have read the excellent 50 Teams that Mattered by David Hartrick and know the answer is Sheffield FC, the world’s oldest football club. Back in 1855, members of a Sheffield cricket club organised informal kick-about with a medicine ball without any official rules. Two of the players decided that they preferred the game than cricket and so formed the Sheffield Football Club. The inaugural meeting of Sheffield F.C. took place on 24 October 1857 and initially, Sheffield FC games were played among club members themselves and took the format of “Married v Singles” or “Professionals v the Rest” as there weren’t any other clubs around until 1860 when local side Hallam were formed. The club drew up a list of rules by which the game should be played, unsurprisingly known as Sheffield Rules. These rudimentary rules of the game included the fact that players could handle the ball, though not catch it, players could push each other over but not kick or trip and each player should come prepared with their own red and blue flannel cap. The impact of these two gentlemen’s decision to kick rather than throw a ball on the global economy today is hard to quantify but it runs into billions of pounds per annum. Not only did Sheffield give us the beautiful game they are a club that has a habit of collecting firsts. First football club, first winners of the FIFA Order of Merit and first and only club to win an FA Cup tie on the toss of a coin, back in 1873 against Shropshire Wanderers. Despite all that they did for the foundation of the game, within a couple of decades they were amateur outsiders looking in at the development of a professional game. They did win the 1904 Amateur Cup against Ealing, a competition that they championed in being set up in an ever modernising and professional game. A few years later they had moved into the local leagues where they stayed until just five years ago, finally earning a place in the restructured Northern Premier League. In the same season that the club moved up the Non League pyramid they celebrated their 150th anniversary with a game against a small little side from Italy at Bramall Lane. . Nearly 18,500 turned up to see Pele introduce Inter Milan as opponents for the celebratory match which the Italians won 5-2. Bramall Lane had originally been the club’s home for a few years before moving to the Owlerton Stadium (now a greyhound track) and Don Valley Athletics Stadium before settling in the Coach and Horses pub car park in 2001. Ten years on and things are still looking up for the World’s oldest football club. The ground, now renamed the BT Local Business Stadium is very much home to the club, and last season they came within a whisker of promotion. As a fellow owner Member-owned club it was only good and proper that I made a pilgrimage to the real home of football. This wasn’t a journey to be made alone and it didn’t take much to persuade Northern Steve to come along to Sheffield. It rarely takes much to lead him astray when I come up. Well, it didn’t take much to persuade him, but Current Mrs Fuller and Sister of Current Mrs Fuller demanded a night away as compensation. So we all headed across Lincolnshire, Nottinghamshire, Derbyshire and finally into South Yorkshire. “We want a nice hotel, centrally located, with a bit of atmosphere” they asked, so I booked us into the Copthorne Hotel which is now part of Bramall Lane. And with Sheffield United playing at home, there would be plenty of atmosphere for them to enjoy whilst us “boys” headed down the A61 to the village of Dronfield to meet up with local hero, David Hartrick in the Coach and Horses for a pint of footballing history and a packet of nostalgia grass-roots style. The Home of Football is actually in Derbyshire, and is very rural to say the least. The Coach and Horses is a fantastic pub, albeit on a small-scale, with a raft of local beers from the Thornbridge brewery including a cheeky 7.4% Yule Beer and some outstanding food (black pudding fritters, wild swan sausages, named after a beer and not the protected birds and pulled turkey wrap – tick). Halesowen Town had brought a big firm for this game, albeit they all needed a “little sit down” after the walk up the hill from the car park. It seems that Sheffield FC is a popular day out for clubs in this league, and you can see why. Sheffield 0 Halesowen Town 3 – BT Local Business Stadium – Saturday 12th January 2013 How can you quibble at paying six pounds (SIX!) entry for a game at this level? Full marks for the club for this pricing level, it is just a shame that more fans hadn’t made the trip on a chilly afternoon. You cannot fail to be impressed by the list of Members of the club, displayed on a wall inside the ground. Pele, Joseph Blatter, Jack Warner (still listed as a FIFA Vice-President which is a bit of a joke), Sir Bobby Charlton, Clare Tomlinson and the drummer from Def Leppard. Quite a list of luminaries. Couldn’t see any of them in the crowd today though, which were mainly huddled in the McDonalds Community Stand behind the goal, or the covered terrace backing onto the pub. On the far side the grass bank was covered with a huge banner proclaiming the BT patronage and a small note from FIFA telling us they were “For the game”. Shame about Jack Warner though. The teams emerged to a faint ripple of applause and a little ditty on a kazoo courtesy from a small child in the stand. His renditions of such terrace classics as “Oh when the saints”, “Go west”, “You’re going home in a Dronfield ambulance” and “My old man said be a Spirites fan” were a highlight of the game for me. Halesowen had been on a good run recently, with dangerman Ben Haseley already having scored 27 goals this season and they looked the more threatening side in the opening exchanges. With temperatures dipping below zero the pitch was crisping up in places, meaning that sometimes the bounce was true and in other instances it simply stopped dead, including the attack that led to Halesowen’s opening where the lack of bounce caught the Sheffield defence on the hop and that man Haseley nipped in to poke the ball home. Despite ending the half the stronger side with plenty of penalty area pinball somehow not resulting in a goal, they were two-nil down within sixty seconds of the restart. Another long ball, another misreading of the bounce of the ball and Haseley was in again to double their lead. It simply wasn’t happening for Sheffield and Haseley took full advantage of the home side’s pushing forward to make it three-nil, his Hartrick and number 30 for the season. Sheffield did try to play along the ground despite the inconsistency of the pitch, and with players in the side with surnames like Rooney, Gascoigne and Waddle they had something to live up to. Alas they couldn’t inspire some Italia90 or Euro04 magic and the final whistle saw the majority of the 253 fans go home frustrated. Our night was young. After a final pint of Jaipur IPA in the Coach and Horses we headed back to the bright lights of the city centre. We met the girls as we walked into the foyer of the hotel. Their experience of Sheffield was very different to ours. The Blades had lost 2-0 to Yeovil so they sought solace in a bottle of Pinot Grigio in Yates. We headed off to West One, a swish little complex of bars and restaurants before ending up in Reflex which is “The premier 80’s bar in Yorkshire”. The first songs we heard when we arrived? Grease Megamix (1978), We are Family (1979) and Queen’s Somebody to Love (1976). The patrons of the bar were mostly on the large side, wearing clothes that were obscenely too small and things were popping out all over the place. Not a pretty sight and one we didn’t want to be burnt on our retinas so we headed back for a nightcap or three at the hotel. A great day out and one that was long overdue. Every football fan should make this trip at least once, and after this visit it certainly wouldn’t be the last time I make the pilgrimage to the Home of Football. More photos from the afternoon can be found here.